Jubilant to invest Rs 13 crore for 10 outlets in Delhi/NCR region. Dunkin' Donuts has made its entry into the Indian market with Jubilant FoodWorks and couple of stores in Delhi. The brand is well-recognised across the US market where it has close to 6,500 stores. As per the Dunkin' philosophy, the brand has made selective offerings keeping in mind the Indian customer’s taste palate. Talking about the brand and its strategy, Ajay Kaul, CEO Jubilant FoodWorks Ltd said,” After 17 years of success with Dominos, Jubilant is confident of building up the Dunkin' Donuts brand in the country in the years to come. We will be utilising the supply chain support of Dominos and our extensive network reach will enable us to make the entire back-end operations possible. We invested around nine to 10crore last year primarily in to the Research and Development process and we will be investing another 12-13 crore this year,” Kaul adds. In an exclusive interaction, Amritesh told Indianretailer.com, “When we say local, we would not be offering Samosas, lassi etc. instead our offerings will be well appreciated. The brand plans to focus across all formats initially and then gradually opt for the one more profitable.” Targeting the 18-25 age group of urban India lifestyle, Dunkin' Donuts will be opening 10 stores this year all in the Delhi/NCR region for now. The store is spread across 2,500 sq. 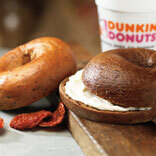 ft Dunkin' Donuts is available across 32 countries spread over five continents. In February, 2012, Indianretailer.com had reported Dunkin’ Donuts would be launched by Jubilant FoodWorks in H1-calendar year 2012.